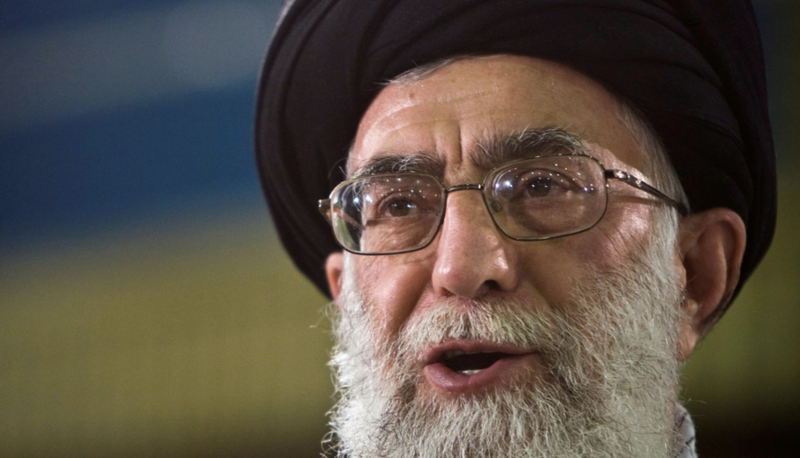 Iranian Supreme Ruler Ayatollah Ali Khamenei is putting a new spin on an old slogan. Americans who have been around since at least the days of President Mahmoud Ahmadinejad, who famously antagonized George W Bush and Barack Obama, will remember Iranian chants of "Death to America" filling the airwaves. But in the age of Trump, with tensions between Iran and the US back at a breaking point after the president pulled out of the Iran deal, Khamenei has clarified that when Iranians chant "Death to America" they really mean "Death to Trump" (and his top national security and foreign policy officials like National Security Advisor John Bolton and Secretary of State Mike Pompeo). At least that's what Khamenei told a group of Iranian air force officers during a speech to celebrate the 40th anniversary of the Iranian revolution. "As long as America continues its wickedness, the Iranian nation will not abandon ‘Death to America’," Ayatollah Ali Khamenei told a gathering of Iranian Air Force officers marking the 40th anniversary of Iran’s Islamic Revolution, according to his official website. Maybe if European nations like Italy had stepped up their purchases of Iranian oil, or if the EU had succeeded in creating the alternative payments vehicle to help importers of Iranian crude bypass US sanctions, the Ayatollah would feel differently. This entry was posted on Friday, February 8th, 2019 at 9:50 am and is filed under Immediately available to public. You can leave a response, or trackback from your own site.